RedVector is happy to announce 10 new, mobile-ready courses approved by the American Society of Landscape Architects. 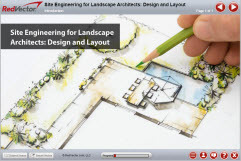 This RedVector Site Engineering series emphasizes principles and techniques of basic site engineering for grading, drainage, earthwork, and road alignment. The material, numerous examples, and problems have been organized to provide students with a progressive understanding of the subject matter. Landform and the language of its design are discussed descriptively in Design and Layout. This course also includes methods for site dimensioning and layout. Grading investigates environmental and functional constraints that can guide site engineering decisions. Grading of linear elements and planar areas is outlined, while a procedure for developing grading solutions involving these different parts working in conjunction is the focus of this course. The integrated relationship between site design and site engineering is also emphasized. In Contours, Forms, Interpolation, and Slope, the concept of contour lines is introduced and a baseline of common contour signatures is delineated with explanations of interpolation and slope formulas and examples of their applications. Soils and earthwork including soil properties, soil classification, grading terminology, construction sequencing, and the computation of earthwork volumes are presented in Soils in Construction and Earthwork. Procedures for designing horizontal and vertical road alignments are presented in Horizontal and Vertical Road Alignment. In an effort to give real-life context to the information being learned, case studies have been introduced throughout the courses. approach to site development that is environmentally sensitive and intellectually stimulating.